(Bloomberg Opinion) -- A train wreck that everyone sees coming still hurts. Biogen Inc. announced Thursday that it was discontinuing late-stage studies of its Alzheimer’s medicine aducanumab. That shouldn’t be a huge surprise: Every other drug attempting to treat Alzheimer’s the same way — by targeting the buildup of amyloid beta plaques in the brain — has failed. At some point, the conclusion has to be that the approach is fundamentally flawed. 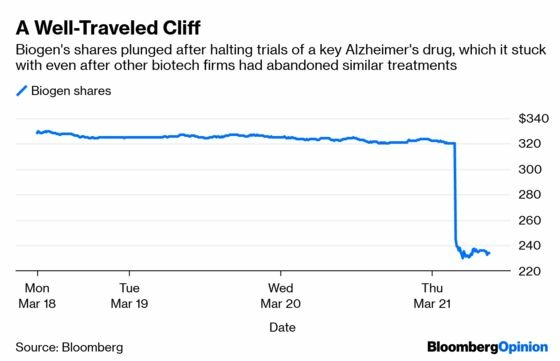 Other firms got there earlier and less expensively than Biogen, which has made Alzheimer’s gambles the center of its drug pipeline. Now, Biogen investors are paying the price — the firm’s shares slumped more than 25 percent in early trading Thursday, wiping away a decent chunk of the company’s market value. This isn’t one black mark on an otherwise healthy company. The massive potential upside aducanumab represented had served to paper over other issues at the biotech giant. The failure raises the stakes for Biogen and as it contemplates its next move to bolster its roster of medicines, and it argues for something big. Biogen’s top moneymaker now is its multiple sclerosis franchise. But growth has already leveled off for that aging group of medicines. If anything, sales might decline in an increasingly competitive market. Even more downside looms if a challenge to patents on Tecfidera, the jewel of the franchise, results in earlier-than-expected generic competition. The potential headwinds in multiple sclerosis have been mitigated somewhat by the rapid launch of the firm’s rare-disease drug Spinraza, which is expected to pass $2 billion in sales in its third full year on the market. But its growth has already slowed because the medicine targets a small population that switches to a smaller and less lucrative dose over time. With highly promising competing medicines from Novartis AG and Roche Holding AG expected to launch in the next year or so, Biogen could see another key franchise go flat. This brings us to Biogen’s late-stage pipeline, which outside of Alzheimer’s is sparse. Its early- and mid-stage efforts include a high proportion of other risky neuroscience gambles, and it spun off its growing hemophilia franchise in 2017. 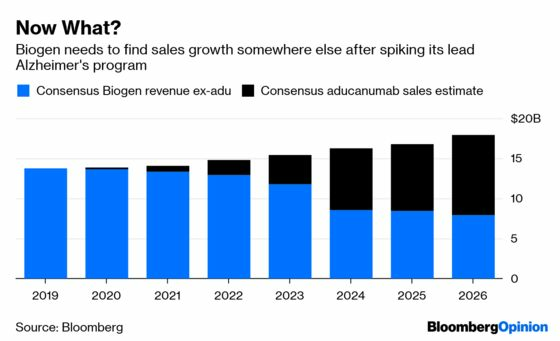 As long as there was a chance that aducanumab might work, investors could focus on the tantalizing prospect of an instant blockbuster. The need for an Alzheimer’s drug is so great that Biogen was willing to gamble not just on continuing to pursue aducanumab as similar rivals flopped, but also building the broadest pipeline of potential treatments for the disease in the industry. That pipeline will likely look a bit more bare after Biogen fully accounts for this failure and acknowledges how far away it is from understanding this disease. The full risks of the company’s approach are now apparent. There’s an appeal to pursuing tough problems like Alzheimer’s that large parts of the industry have given up on, and any success will be richly rewarded. But that angle comes with big risks and a high failure rate. The strategy is something of a luxury that Biogen may not be able to afford for much longer as its revenue base and investor trust begin to erode. A more diversified strategy, perhaps anchored by a decent-sized deal, could help chart its way to a more stable future.